Lake Jump raises $85,390 for Lakeshore Food Club. 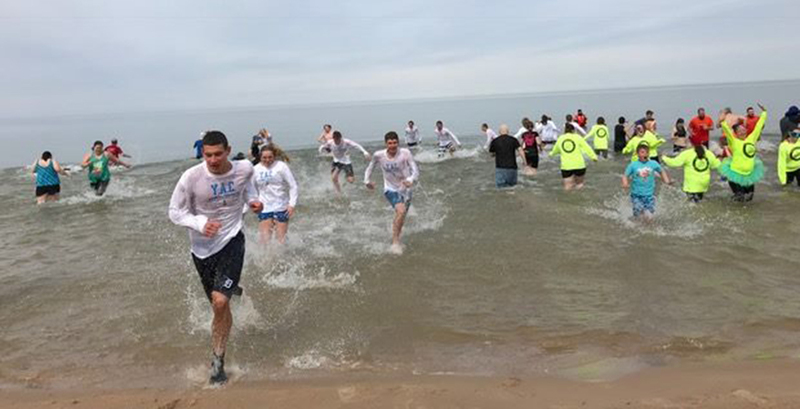 LUDINGTON — This year’s Ludington Lake Jump, held on April 21, raised $85,390 for the Lakeshore Food Club. Each year, the Team Challenge Trophy is presented to the team that raises the most for charity, giving its members bragging rights for the rest of 2018. This year’s winning team was Western Land Services, raising over $12,000. The Community Foundation for Mason County Youth Advisory Council will receive pizza and breadsticks from Spanky’s Pizza in addition to a certificate of appreciation for raising the most in the youth team category. Father Mick Shriver will receive an overnight stay at Little River Casino Resort for raising the most pledges as an individual. Alex Sutter received the most pledges in the youth division and will be presented with a certificate of appreciation and a box lunch courtesy of Jimmy John’s. The Ludington Lake Jump has raised more than $519,000 for local charities since it began in 2000.